Who Will Change Euro Coins? Who will change Euro coins into cash…? Maybe you are wondering who will change euro coins, out of date currency and leftover foreign coins that many of us find cluttering the drawers and pots in our homes following holidays and forgotten trips abroad. These are the coins that are pretty much useless in the UK, but which could be exchanged for Sterling if you know where to look. The problem is that banks will not change coins for you or if they do they will charge you a hefty sum of money. Wouldn’t it be better to find a service you can use time and time again and which gives you a great exchange deal for the right price? So who will change euro coins and unwanted currency? In a nutshell… we will!! Cash4Coins offer a service to exchange foreign coins that is favoured by the likes of charities, hospitals, banks, schools, clubs and private individuals. It is fast efficient and we are always on hand to assist you with fundraising ideas or just offer help and advise on how to exchange foreign coins. What’s more our process couldn’t be simpler. Once you have collected together your leftover coins you simply send them to our address, where they will then be counted and sorted before we make you an offer. Once you accept Cash4Coins offer you will receive prompt payment either via BAC’s straight to your bank account, Paypal or if you prefer Cheque. If for some reason you are not completely happy with the offer we make you we will also return the coins to you at no cost – so there really is nothing to lose. This is our 100% satisfaction guarantee. It really could not be easier and we have helped many people across the country to enjoy their old foreign coins. Just imagine what that extra money could do for you. A night out, some new clothes or simply helping with the bills – these are all things our customers have used their money for and you could do the same. We even offer FREE collection over certain weights as well as a drop off service with almost 5000 drop off points across the UK – so getting your coins to us is very easy and convenient. You can see more info on ‘How to send us coins‘ page. You don’t even need to sort and count your coins as we will do the hard work for you. 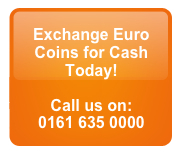 It’s the easier way to exchange foreign currency and should answer the question of who will change euro coins for you! If you’re one of the many people who have been wondering who will change euro coins then wonder no more as Cash4Coins can help. If you’d like to see what our customers say then take a look at our comments page. If you’d like to send us coins today then please go to our page ‘how to send us coins‘. We promise quick service and you could have your money in your bank account in a matter of days. It really is that simple, so what are you waiting for?